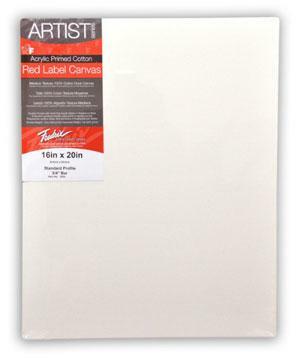 Fredrix Red Label Canvas features superior quality medium textured, duck canvas. It is double-primed with acid-free acrylic gesso for use with oil or acrylic painting. The canvas is stapled onto the back of standard stretcher bars. Paint on all four edges and hang it with or without a frame. All sizes larger than 24" × 36" include single or double bracing for added support. Available in Standard (3/4" Deep) and Gallerywrap (1-5/8" Deep).